SimiSodaPop | A Refreshment Of Bubbly Gossip! | Beauty, Fashion, Food and Entertainment: Carolina Pad - 3 Items - REVIEW & CONTEST/GIVEAWAY! Carolina Pad - 3 Items - REVIEW & CONTEST/GIVEAWAY! The 3 Items all together that YOU can win! This is a great review about some products i recently tried and im loving, and i wish to share the brand and products with all you! The Brand is called "Carolina Pad" and they make super adorable lovable stationary items and more! I was really happy to have discovered this lovely brand, they make such gorgeous designs for notebooks and such, and GREAT QUALITY TOO! For this review i will be showing you 3 of their newest items and you also get a chance to enter to win the EXACT! 3 items im talking about! So here are the pictures i took of the 3 items for Carolina Pad! Ok so i have to tell you i have fallen in LOVE with this company! If you know me well then you know that i love stationary items and i fell in love with this company instantly because they have such a wonderful selections of beautiful designs for notebooks and such and i have very much enjoyed all 3 of these items from Carolina Pad! The Charleston Bookmark and Flags, The Errand Runner & The Information Organizer have all been amazing for everyday life and my favorite would have to be the gorgeously designed Errand Runner. It's super cute & I have been loving using it to plan out my day everyday, when i wake up and think, okay i have to remember to this, this & this, then all i do is so easily write down the important things i need to do for that day, i love that it's planned out from 7am till 9pm, but a little lovely edition would be if it was from 4am till Midnight. Since im very busy and lots of my important times to remember are from times that are not from 7am till 9pm mark. I would love it if they extended the Errand Runner to be A JUMBO edition. The Charleston Bookmark and Flags i have been loving also, i have put it up on my fridge and its so handy to have it around close to the kitchen because i love cooking and when im looking through cookbooks or magazines i love to use the little bookmarks to put on interesting things i find in the pages of the cookbooks & magazines. The Information Organizer has been wonderful to keep important business cards and important papers in. This information organizer is such a well designed and lovely item that i recommend for all busy people that have alot of loose cards & papers that need to be organized! It has lots of Sleeves & Dividers & Pockets & Sticker Labels for dividers! Its perfect for the busy type of person... LIKE ME! Overall i want to thank Carolina pad for making amazing items and hope to try more of their products soon! look below and enter to win! 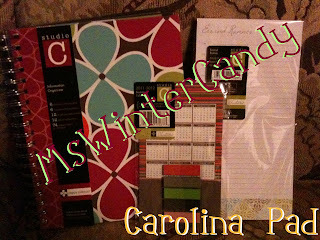 The Giveaway: One of my readers will win the "Exact 3 Carolina Pad items i tried out." Doing both these things will get you fully entered to win. Doubles of the same person sending me more than one email or more than one tweet will be counted as only 1 entry! and tell me "Why YOU want to win this Carolina Pad Prize!" and tell me your FULL NAME, AGE, Country! By completing the above, you will be entered to win this prize. 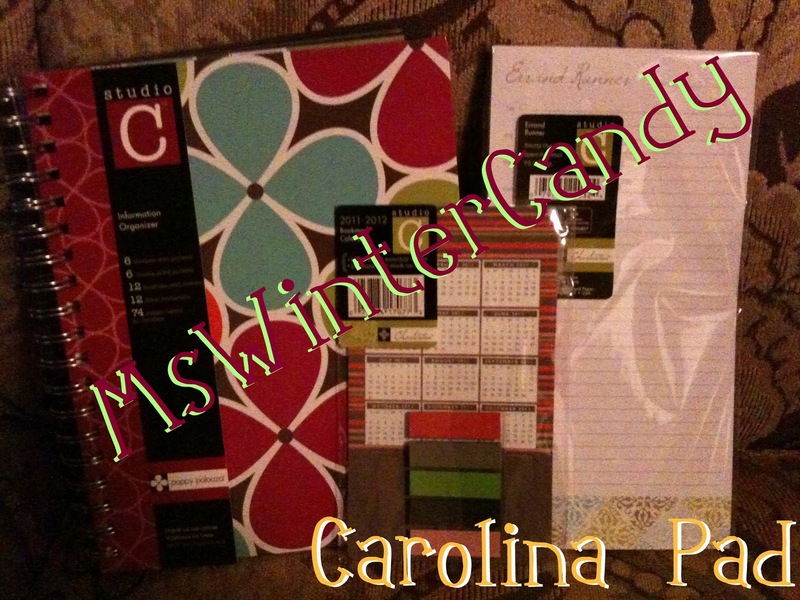 & Anyone who has won a Carolina Pad prize pack or gift certificate in the last 90 days is NOT eligible!